The Maryfield Public Speaking team recently took part in the annual competition run by the Irish Federation of University Women. Each student delivered an impromptu speech on a topic given half an hour before the event. Speaking in the Under 15s category, held at the Quinn Building UCD, Nina Coughlan Colley, Ailbhe McCaughey and Lailatul Rahman proudly represented Maryfield College. Nina spoke out brilliantly on her topic; Celebrity: the price is too high. Ailbhe thoroughly engaged the audience with her topic; Do young people drink too much? Laila gave an extremely convincing speech on the topic; School uniforms should be abolished. Well done to each to each of the girls and a big thank you to Ms Whyte for preparing the team! Maryfield College choir recently performed in the choral section of the Kilkenny Music Festival. This was a very enriching experience for these students whose love of singing was very evident on the day. They sang in two competitions and were awarded a second place and third place against very notable competition. Participating in the Sacred Music and Post-Primary School Choir categories, they gave very musical performances of John Rutter’s May the Lord Bless You and Keep You and Karl Jenkins’ Adiemus. Adjudicator Peter Stobart commended the choir for their tone and musical interpretation, produced under the baton of their dedicated conductor Ms. Flynn. You can listen to the choir’s prizewinning performances on the below video. 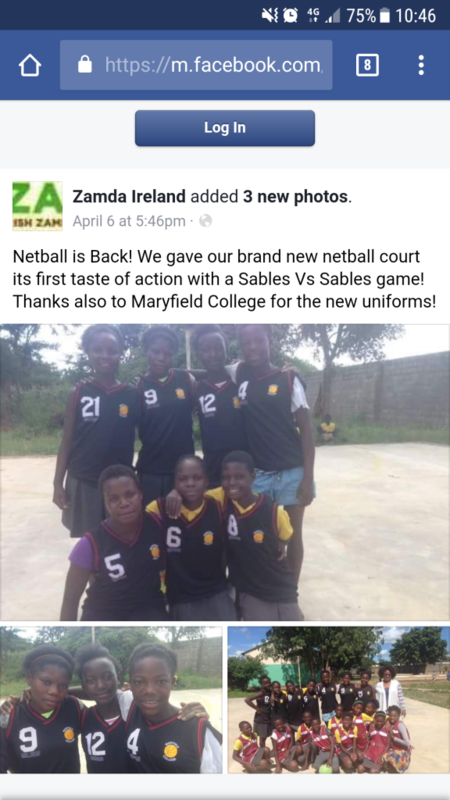 Zamda Ireland thanks Maryfield College for new uniforms.